We'll only be giving out 1,500 custom Animal Planet minis tomorrow starting at 11am, not more than 1,500. We'll actually be parked on 5th between 22nd and 23rd for the giveaway, not the intersection you listed. 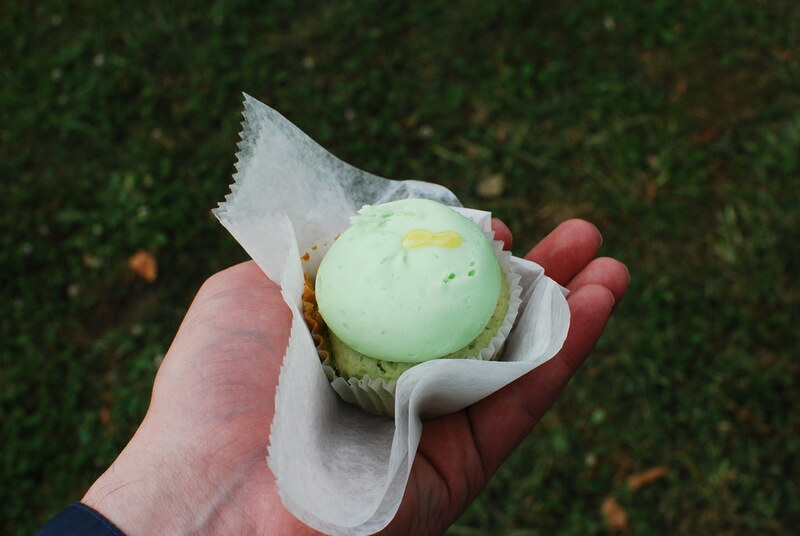 The Vendy Awards, for New York City's mobile food carts, happened this past weekend, and cupcake truck CupcakeStop was a finalist, but wound up losing out to Wafels and Dinges. As you can see, Cupcake Stop brought every flavor they could pack on the truck. 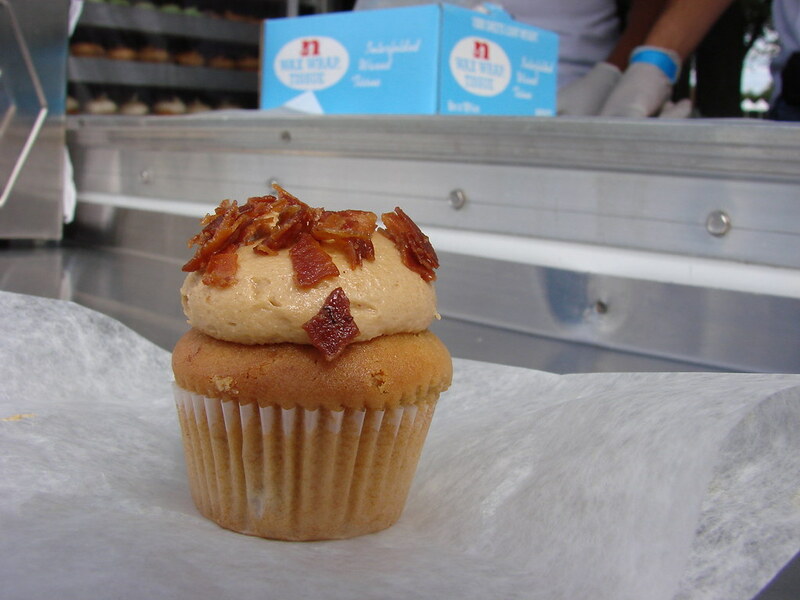 I decided to try their version of the Elvis cupcake, a banana cake with peanut buter frosting, and of course, bacon. I was surprised how moist the mini was, those wee ones can be tricky, and when the Great New York City Elvis Cupcake Competition occurs, and it should happen if only to find out "The King" of the Elvis', this is definitely in the running. The cupcake stop brought a huge menu of interesting offerings. Based on my time at the cart the red velvet and Elvis (with bacon flakes) were the two most popular varieties. With many women opting for the red velvet and men opting more for the Elvis. 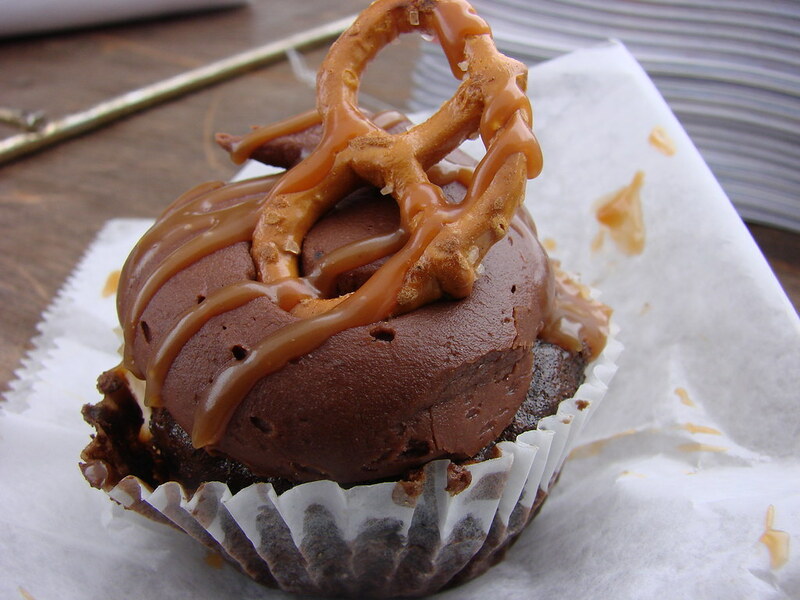 The caramel chocolate pretzel was also popular and was my favorite of the 6 flavors I tasted. These cupcakes were superior to most of the cupcakes I have eaten in the last 6 months in New York City. Creative flavors, moist and frosting that is not too sweet! Spork City has some great photos of the cupcakes. If you want an inside look at the non-cupcake aspects of the Vendy Awards and what it's like to be a judge, check out our pal Zach Brooks' writeup at Midtown Lunch. 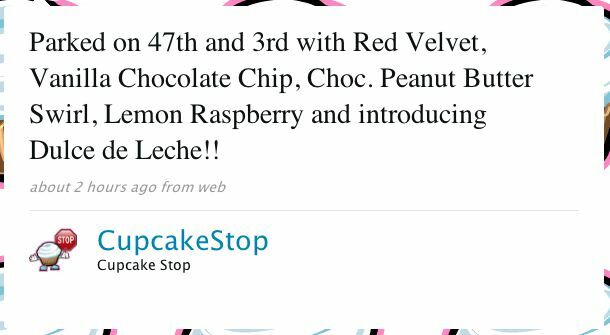 What flavors did Cupcake Stop serve? What flavors did they not serve is the question. Peanut butter, red velvet, chocolate and vanilla of course, PB&J, key lime, banana pudding, something with bacon, and new for fall, pumpkin. What: Pet trainer, YouTube sensation and host of Animal Planet’s SuperFetch, Zak George, will host a stunt show with his border collie Venus, demonstrating the amazing tricks that can be taught through proper training techniques demonstrated in Animal Planet’s new series SuperFetch. SuperFetch premiers on Animal Planet on Saturday, October 3rd at 8:00pm on Animal Planet. More than 1,500 mini SuperFetch cupcakes will be given away to the first customers to visit the CupcakeStop Truck parked at the intersection of Broadway and 5th Avenues at 23rd Street on 5th between 22nd and 23rdbetween 11:00am and 1:00pm. I missed last week's Old Navy cupcake giveaway in SoHo and can't make this one, but hopefully some of you can take advantage of it.